What software or online tools can detect the parts of speech in a piece of written text (e.g. to predict if a word is a verb, adjective, etc.)? I have had good results with the Stanford POS tagger. There is a web demo system called ICTCLAS (Institute of Computing Technology, Chinese Lexical Analysis System). It was developed by the Institute of Computing Technology, Chinese Academy of Science. 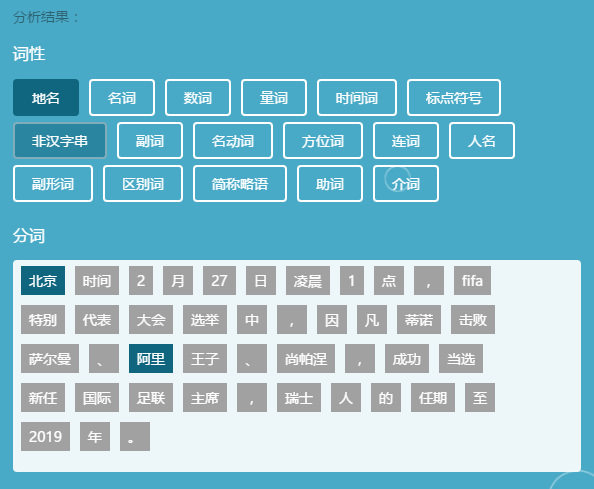 There is also a web demo system from THULAS (Tsinghua University - Lexical Analyzer for Chinese), which was developed by the Nature Language Processing Group, Tsinghua University. NOTE: I don't know (and I cannot test) whether these site can be accessed freely across the world. NOTE2: As with any software language tool, take the results with a grain of salt, they aren't perfect. There are many lexical analyzers for Chinese, but these are not developed for daily use, the typical usage is Chinese searcher engine. The default result seems complicate, I deselected "语义依存分析" and "语义角色标注". These tool can not be 100% accurate, for example, "选举" in the sentence is a noun, not verb ( so the SBV relation is also wrong, SBV means subject-verb), the biggest mistake is it split 因凡蒂诺(Sorry, Mr.Infantino) to 因 and 凡蒂诺. These errors are understandable, it is still helpful. Not the answer you're looking for? Browse other questions tagged grammar software academic or ask your own question. Where can I find a downloadable database of English to Chinese words? What etymology dictionaries are available? What software can check for grammar mistakes? how does the immediate constituent analysis of the phrase/sentence 聊斋志异 look like? What can be put between the both parts of a separable verb?